Sandpiper at Bonita Bay in Bonita Springs, Florida. 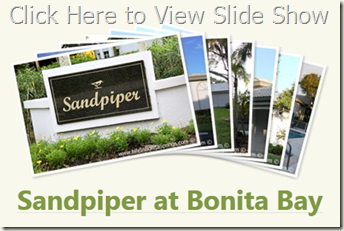 Sandpiper at Bonita Bay is a condominium complex located in the community of Bonita Bay. Sandpiper condo consists of nineteen buildings, each with covered parking in free standing buildings, which also have a small storage area for each unit. Sandpiper is located just off of Hidden Harbor Drive and not far from the intricate walking path system of Bonita Bay. Sandpiper is completely built out and there is only resale real estate available at this time. The complex of Sandpiper was built from the year 1990 to 1994. There is a total of one hundred-twenty individual condominium residence homes located in the Sandpiper condo complex. Square footages of the individual units range from 1,340 square foot to about 1,700 square foot of living area and offer from two to three bedroom condominium units. The views from units in Sandpiper are either lake view, nature preserve view or a combination of the two. Landscaping is mature and established. Hanging moss and air plants are located on many of the trees which include live oak and mahogany trees. The nature preserves at Sandpiper at Bonita Bay draw a variety of indigenous, wading birds to feed, roost and nest at the lakes and surrounding woodlands. Similar condo complexes in Bonita Bay with both similar views, building structure and covered carport parking include Whiskey Point at Bonita Bay. A community swimming pool, spa and tennis court are available privately for Sandpiper condo owners. Sandpiper at Bonita Bay owners enjoy all that Bonita Bay offers with access to a private marina, beach facilities, miles of biking and walking paths, multiple interior parks and the member-owned private golf club, featuring five 18-hole golf courses, tennis & fitness facilities.